Corsages are dainty flower accessories worn by women for a wedding. More traditionally these were worn by the mothers and grandmothers of the bride as well as the groom. They used to pin a set of tiny cluster of flowers on the left side of the dress. And, the color of those used by the mother’s was kept exclusive and its design distinctive. But, over the years, the use of corsages has been molded and mended to suit personal needs. What is retained is that corsages are still made of a bunch of small flowers interspersed with decorative shrubs and leaves. Apart from this women have started using them variedly. Some use a corsage as a brooch, others use it traditionally around the waist, and yet others use it as a wrist accessory. Brides in particular have started substituting wedding bouquets with wedding wrist corsages. These are more convenient to use and allow the bride to remains hands free for the ceremonies of the wedding. The one thing that brides stick to is the tradition of using these writs corsages only on the left side of the body, and by rule they all adorn their left wrist with beautiful flower corsages for the wedding. Some brides are also a little paranoid of being poked by the pins. They would not like their wedding dresses to get a slit, just because they tried decorating/pinning it with a corsage. The best alternate here is a wrist corsage, in which flowers are wired around a circular bracelet and worn easily around the wrist, without poking the fabric or your skin. 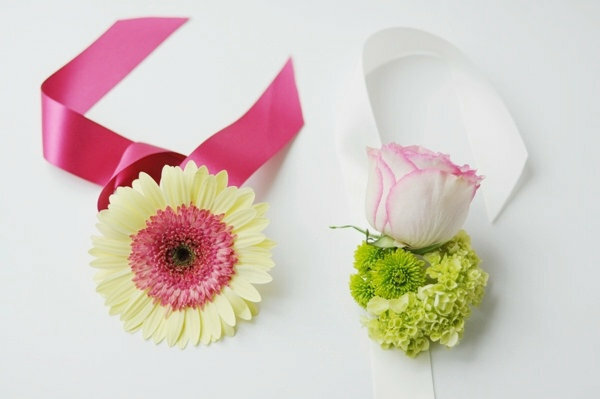 After you’ve decide to wear a wrist corsage, the next step is to decide about the flowers you’d like. One can choose from fresh, seasonal flowers or choose artificial flowers that match the color and texture of the dress. Ask most brides, and they will prefer fresh flowers for their natural fragrance and subtle beauty. And, corsage does not use more than a few sticks of flowers, affordability is not the criteria. Orchids are the most popular variety of flowers used for corsages, and these are followed by roses, lilies and carnations. Magnolia is also popular, but mostly used by mothers and not brides in the wedding. To make the experience even more interesting, you can make a wrist corsage for yourself. You will need simply material like a few small flowers (roses, orchids, etc. ), a filler flowers and sprigs, a floral tape, wire and some glue. Design and cast a small bracelet you’d like, tape flowers to the wire and insert sprigs, alternately, and soon you’ll have your own wedding wrist corsage ready. A wrist corsage is a popular option for weddings and is the perfect choice for School Balls and formal events. nice Photos here.